Posted on 6, May 2016 by EuropaWire PR Editors | This entry was posted in Automotive, Awards, Germany, Marketing and tagged Audi, Automotive Innovation Award, Dr. Stefan Knirsch, “Most Innovative Premium Brand”. Bookmark the permalink. Ingolstadt/Frankfurt am Main, 06-May-2016 — /EuropaWire/ — Audi claims three wins at the Automotive Innovation Award. The award is presented by the research institute Center of Automotive Management (CAM) and PricewaterhouseCoopers AG (PwC). 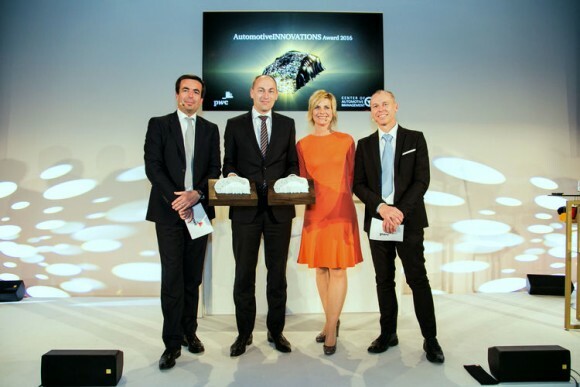 Audi wins the “Most Innovative Premium Brand” main prize. The brand with the four rings also receives awards for its innovations in the categories “Connected Car” and “Vehicle Concepts/Body”. “These awards are both praise and motivation for our team,” said Dr. Stefan Knirsch, Member of the AUDI AG Board of Management for Technical Development. “We are an innovation driver for classic and alternative drive systems, lightweight construction and production processes, connectivity, driver assistance and piloted driving – and we are working continuously to maintain our ‘Vorsprung durch Technik’.” The Center of Automotive Management and PricewaterhouseCoopers AG presented the Automotive Innovations Award for the fifth time this year. Over 1,400 innovations from 20 automobile manufacturers and 50 brands were considered for the award. The award ceremony was held Wednesday evening in Frankfurt am Main.